Surprisingly, when I type this phrase into google, a few unpleasant results show up right on the first page… in addition to all the surf-related websites of course. Some comments I read seem to me over-exaggerated, but I guess they affect one’s decision whether to choose Taghazout as a destination or not. 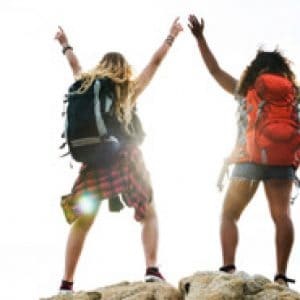 That is why, this article is for hesitant travellers, but to help you remove doubts right from the beginning, know that the basic answer is Yes. Of course, Taghazout is safe. Is there a lot of hassle in Taghazout? When you show up in town with your luggage and no hotel reservation, you will be approached by a local stranger offering to show you hotels. Usually, hostels pay them to bring newcomers. You can either reject and explore the place by yourself, or accept the guiding. It is definitely easy to find your way in, but it is also fine to be assisted. Your call! 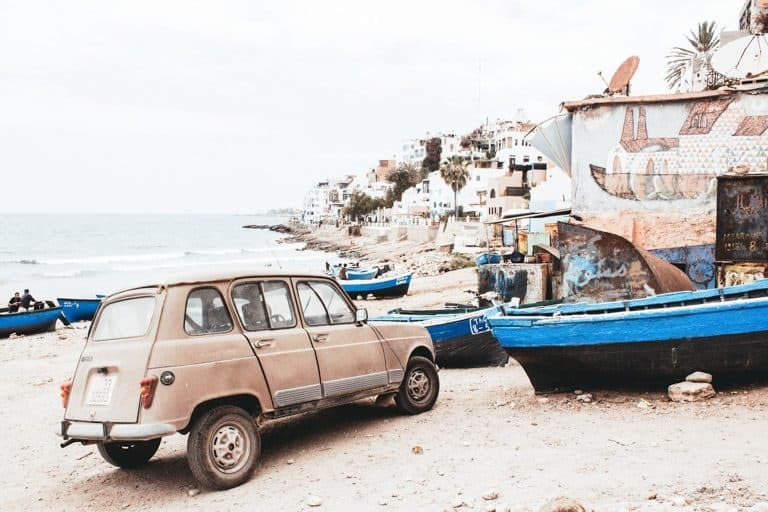 Taghazout is highly instagrammable. You will want to capture its narrow streets, surfers, unique trees, locals, waves and the list goes on. However, taking photos of camel riders at the beach will involve money for example. They would not pose for a free photo. Ordinary Moroccans do not like to be photographed. It is very important to ask for permission before trying to take a photo. If they say NO, it should not take away your smile! Parking used to be challenging for me when I first came in town. 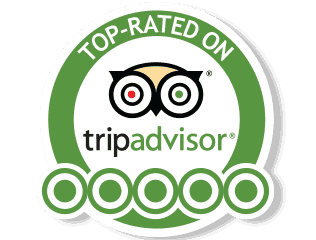 To avoid arguing over ticket prices, which keep changing all along Morocco, ask about prices at your hotel and maybe sharpen your communication skills to know how to deal with a difficult parking guy. A parking ticket should be something like 2dhs at day time and 10 dhs if you park overnight. Locals may stop you to ask questions about your trip, country, politics, customs, family and simply anything. Like most of Morocco, Taghazout is a talkative village and its people like to chat. It is tiring for some travellers, intriguing for others, but when you understand cultural differences, you would embrace these experiences. Usually locals can speak your own language but it is still advisable to at least learn how to greet them in Amazigh. Actually, I do find Taghazout dirty in summer, but I also love wandering around by mid-September because it is cleaner, quiet and the beaches are perfect for swimming. Despite its popularity, Taghazout remains a small village in a developing country. The local commune collects waste, but more people in summer means more waste. The town gets excessively crowded with careless people, and it becomes quite hard to pick up all the waste. Fortunately, life goes back to normal after summer. Well, Summer is not the only dirty season. When there is heavy rain, most of the trash thrown in rivers runs into the sea. This later throws up everything back and the beaches become dirty. It is best to avoid swimming right after heavy rain. 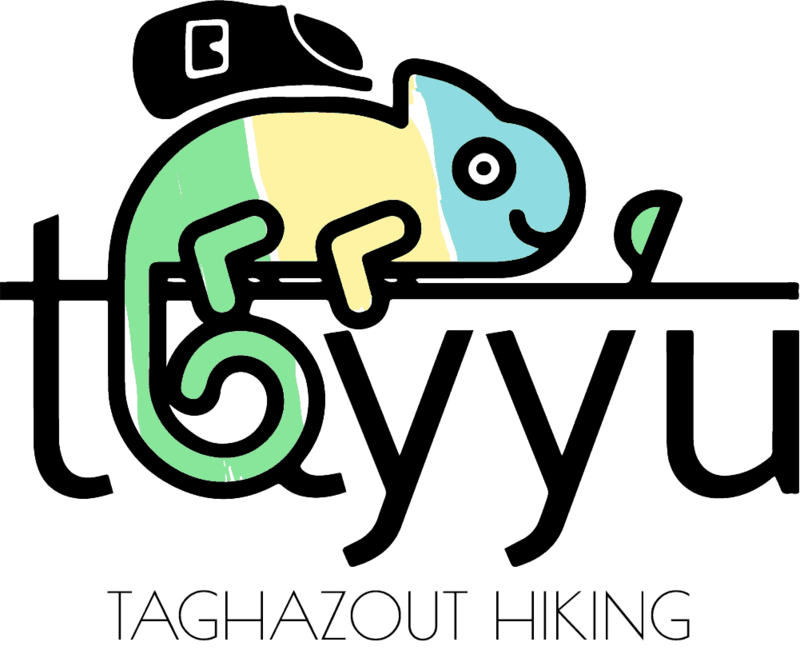 I still do not find the place filthy. If you have been to some other famous cities around the world, then this question would be put into perspective. Now, the main attraction after surfing Taghazout is hiking Paradise Valley. If you read that even this oasis is dirty, this should not discourage you. Read more about Paradise Valley here. Is it true Sewage is dumped into the ocean? It is true that raw sewage is released into the ocean, and while this may appear like a serious concern, learn that raw sewage is also dumped in Dublin’s Southside in Ireland, Fistral surf beach in UK, in some Canadian cities and in almost all Asian countries. The point is that the security we think we have in our home countries is an illusion. It is not necessarily safer elsewhere. Still, No one wants to swim in polluted beaches… especially when aware of. Swallowing contaminated water can expose you to bacteria and maybe an unpleasant stomach flu. The good news is that-as of this writing-a new sewage system is being installed to connect the town to a wastewater treatment system. Sewage issue is not eternal. Meanwhile, where can you still swim in Taghazout? I say SWIM, because surfers are a hopeless case. If there are waves, they will jump in no matter what! Ocean currents carry sewage south. So, it should be better to walk north of Taghazout where suitable swimming beaches are accessible within a walking distance, at least until the pipes are established. Finally, to avoid health issues, it is important to take food and water precautions, carry medicine, or learn about local natural remedies. How safe is overnight parking around Taghazout? Crossing Morocco in a van is a good way to slowly absorb the energy of the country and enjoy adventure on a budget. Many motorhomes are to be seen around Taghazout during Winter. I guess the confident sun of this village attracts different types of travellers. However, overnight camping is not allowed along the coast. The police no longer let campers stay overnight, especially if they are too close to Taghazout (Mystery & Killer spots), Tamraght (Devil’s rock) or Aourir (Banana). Cops are not always that strict about applying the law but there is always the risk of being moved on. One Important thing to remember: Avoid spending the night alone in an isolated place unless you are far away from habitations. If you are staying close to the areas mentioned above, your van needs to be near other cars. Otherwise, you are vulnerable to assaults. 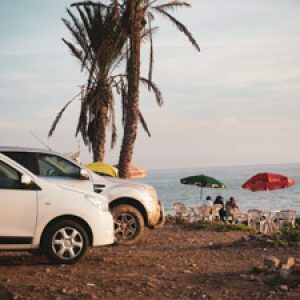 For cautious ones, they can either spend the night inside Taghazout village itself and pay 10 dhs, or head to one of the campsites along the coast. They can also go up the hill for a quiet and free spot. Campsites can be found in Devil’s Rock beach, Killers beach, and Imsouane village. Is there any risk of crimes in Taghazout? Taghazout is a chilled village where crimes rarely ever happen. You are unlikely to ever be in any serious danger. Besides Morocco does not have a high crime rate in general. -Only carry enough money for your day. 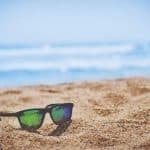 -Keep your belonging at the beach within eyesight. -While in a bus, keep your money in a front pocket. -Leave your passport at your hotel. -Learn a few local (Amazigh) words. -Drink in moderation. If you go clubbing in Agadir make sure to have a number of a taxi driver you are familiar with (No buses available late at night). News media know people tend to rely on feelings over facts, and thus make some countries or cities seem scarier than others. Stop checking your Facebook. Explore the world and never let fear of crimes deter you from travelling. Is it safe to drive in Taghazout? Yes and No. Driving along the coast or through the Amazigh villages is fine and certainly more fun. Besides, renting a car is a necessity when you are a curious surfer, as there are many breaks to check out along the coast. Multiple car rental services can be found online. Prices start from 250 dhs/day and can be reduced to 200 dhs if you keep the vehicle for longer. Expect decent small cars for this price. We drive on the right side of the road and almost all rental cars are manual. Though it is way less challenging than driving in Marrakech, you still need to be somehow experienced. It can be a little bit stressful at Aourir village and along the winding road of Paradise Valley, and did I mention that we cross the road whenever we feel like? Night driving is challenging. Roads are dark and caution is needed on the road N1 as oncoming cars do not usually switch to low beam light. Sometimes, stray dogs also cross this road at night. Police checkpoints are common. You are likely to come across them right after you see a speed limit road sign indicating 60 km/h on a road where you’d think you can go faster than 80 kms/h. Under the influence of alcohol, certain men become violent. Step away if someone becomes aggressive, and avoid taking a ride with a drunk driver. Due to Alcohol abuse, a few fatal accidents have happened on the road between Agadir and Taghazout, especially on Saturday night. 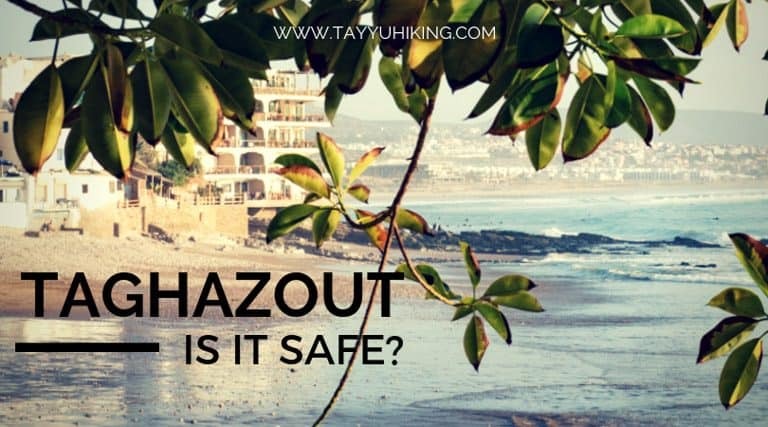 Is Taghazout safe for a female traveller? 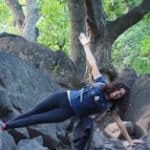 Here is what many solo female travellers think: The unwanted attention you get in some countries is indeed very tiring, but it makes you stronger. Unfortunately, you don’t understand this at the moment itself. Female travellers do attract a lot of attention from men in most of the touristy cities like Marrakech or Fez. Local women have to undergo the same ordeal by the way. Again, Taghazout is not Fez. You won’t get lost in the alleys of a medina and you won’t be followed in any souk. This tiny village has no medina, no alleys and definitely no souks and locals are way more relaxed. In the rest of Morocco, Female travellers are usually advised to dress conservatively. Taghazout is a surf town where everybody is in flip-flops, shorts and t-shirts. You will see bikinis at the beach and surf girls riding waves. The attention you get is not as intense as in Fez for example. – Again walk with confidence. I guess these are so far the questions I could think of. Not all the questions have crossed my mind. 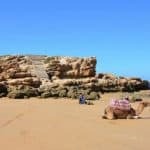 Please note that this article is based on my traveling experiences and on being a Moroccan person who spend a lot of time in and around Taghazout. If you are travelling to Taghazout or simply curious about it, feel free to share your experience or questions.